Found this at Cineworld Shrewsbury, can be used online or in store!!! Does anyone knows if I can have 10%discount and use Tesco vouchers to pay too? Perhaps we are suffering from a bit of Cineworld code fatigue but this is a good deal. It wouldn't hurt people to be a bit nicer. I have an unlimited card. I think OP is right. Was at the cinema last night and saw this. 10% off the cost of a year or 50% off the cost of your first month. Costco sell Bella Italia gift cards 2x £20 for £33. With the Cineworld card you can get an additional 25% off too - so it makes £40's worth of gift cards worth £50 for only £33. oh well i heard wrong, thanks. I missed it anyway so I am not sure how to feel now. Thanks. Booked RP1 for later today! RP1 and Spidey are the two that really stand out. The remote location ending in Fallout is ok too. Deadpool, well Juggernaut looks great big but there would have been better choices for an IMAX movie this festival. Definitely don't need to see Mary Poppins - it's just for sale in the popcorn bit. Would be good to know if the Cineworld discount works on it. No idea.. I didn't really need the popcorn but got it anyway! Hmmm interesting, Glasgow Cineworld Renfrew St on release day were adamant it didn’t come with the popcorn and that it’s was just for illustration purposes. Perhaps as it was the first day the people behind the counter were wrong, either that or you got lucky? For me it was £7 with or without popcorn? 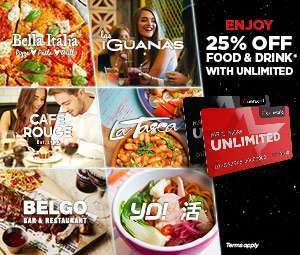 ALL Cineworlders get 25% off their food bill at YO! Sushi restaurants! Today only. I guess Alan Rickman, would now be Dead Hard. I did try and book this last week. But the cinema was already packed. Alan Rickman can't attend this year, he has other commitments. Being dead, would be a hard commitment to get out of. Already seen 1 &amp; 2 about 4 times already this week and I ain't even meant to . Classic but it's on everything and everywhere. The size of most Tv's would rather watch at home . I go to the cinema a lot but if I had a choice to watch at home , I would . I'm already booked for cinema tomorrow so I hope it's good! Only valid for one day (today) https://www.cineworld.co.uk/blog/advent-calendar-day-18: This offer is only valid on Tuesday 18 December 2018, while stocks last. Valid for one free Munchbox with Cheestrings. Not valid on any other products. Customers must present the QR code alongside a valid Cineworld ticket. Only one redemption per person. This offer is not valid for staff. Didn't know about the advent calendar and going on Friday so heat for the heads up even though I can't take advantage of this particular one. Thanks OP. I'm unlimited worked for me, she didn't even look at the ticket I had in my hand but she just said what sauce did it want. I didn't even eat a quarter of them, they weren't nice and the sauce was disgusting... How people pay for them is beyond me! Ugh went there today and now this shows up on the app..
Nah the cheese tastes like plastic, the Salsa dip is the only one worth having. Late reply, but sour patch kids do NOT contain gelatine. Will it work with meerkat wednesday? Easy peasy. 2 x free tickets for 2 bags of donations. Loads of tickets left. Agreed, but it's freezing out there. I think they would prefer the food rather than watching a movie to be honest. Be nicer if they opened their doors to the poor and the homeless to watch a film in the warm. Any film tickets going for £5.70. Enfield and Woodgreen cineworld. £5.70 pricing is still available for standard 2D performances at Cineworld, Enfield and Wood Green. Is this offer only available for a little period, does anyone know? Guess this is Cineworld trying to compete with Vue cinemas offering £4.99* tickets for any movie on any day (* excluding premium formats such as 3D, IMAX or Xtreme)? Would be nice if it was rolled out to more cinemas across the country. ;) Edit: Looks like the £5.70 pricing only lasts until Thursday. From Friday the prices seem to revert back to normal. Did you check Enfield and Woodgreen? Not sure why this deal has been expired, four more movies are still available today (Tues 2nd October 2018). I'd be interested to see an Imax film trailer but I'd not be interested in actually going to see a full film. Rather watch at home with headphones. Why would you not want to? Stop, start, rewind, pause frame, frame by frame, eat my own food and beer / spirits, use my own toilet, listen and watch in peace, turn volume down at music and up at lines. Damn i can even turn vol up if I'm eating something noisy like Doritos. Cineworld opened its first cinema screens to the public in Stevenage in July 1996. From this single venue, growth has been rapid with new multiplexes regularly opening around the country. The company has bought up several rivals over the years, including UGC, which was previously French owned, and more recently the 24 arthouse venues making up the Picturehouse Cinemas chain. Cinemas are continuously upgraded to include new technology, with the company being one of the first to include 3D facilities at most of its locations, while 4DX technology is now available at some of its cinemas. Cineworld has nine IMAX locations and its multiplexes feature what's claimed to be the world's tallest cinema in Glasgow. Sheffield boasts the most Cineworld screens at one multiplex, with 20 screens available for customers to choose from. Use the "Select my cinema" button. Wait for the "Find a cinema" box to appear. Enter your preferred town, city or postcode. Now, a list of the nearest cinemas will appear. Cineworld's online shop allows users of its website to book tickets, buy gift cards and the company's "Unlimited cards". Preferred individual seats can be reserved, using convenient plans of the chosen cinema, and 3D glasses can also be booked, when needed. What's On: An area which directs customers to first enter their preferred cinema location before listing screenings available. Unlimited Card: A section that allows customers to apply for the Cineworld deal. Gifts: This is where you can look up presents including gift cards and eGift cards. 4DX: Here you can browse through a listing of films available in this format. IMAX: This provides you with an explanation of this format and availability of films and locations in 4DX. VIP: This section is for those wishing to book this Cineworld experience with added extras available at selected locations, including access to a special VIP Lounge. SuperScreen: Here you'll find information about cinemas equipped with this Cineworld sound and screening upgrade, along with films available in this format. Cineworld's "Unlimited card" is an ongoing deal offered to all Cineworld customers and available to buy online at cineworld.co.uk/unlimited. For a set monthly fee, the card allows an individual customer to see as many films as he or she likes. There is no limit to the number of times that fans of a particular film can see that film, but there is a restriction of one ticket per card for each screening. The card can only be used by the designated user, and the is issued with a photo to ensure this. 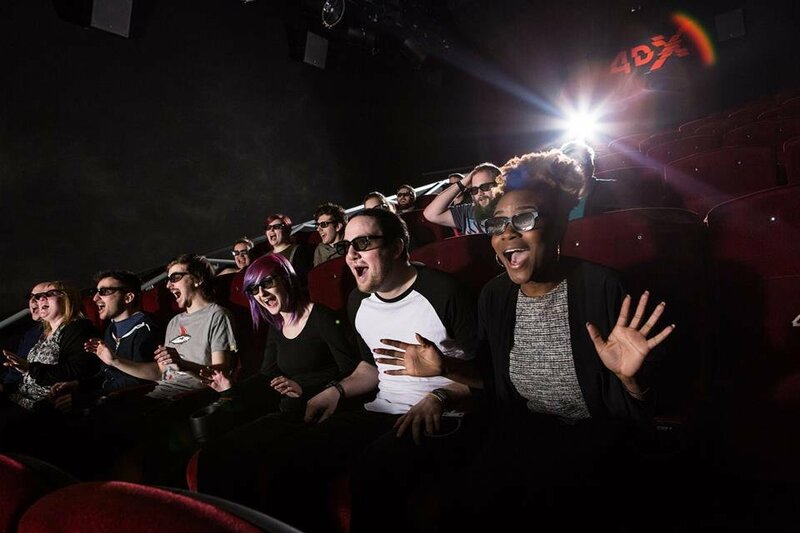 Extras, such as the company's premium seats, attract an added fee as do films screened in 3D. A valid bank card or voucher code. A bank account for monthly payments. Personal details, including an address where the card can be posted to. A recent photo of themselves or the person the card is being bought for. Login to their unlimited account before making their booking. Proceed with the booking in the normal way. Pick up their ticket at the booking office by showing their card. The card can also be used at a Cineworld box office both for advance bookings and to gain access to any film. Additional charges may apply to certain films, screenings and seats. 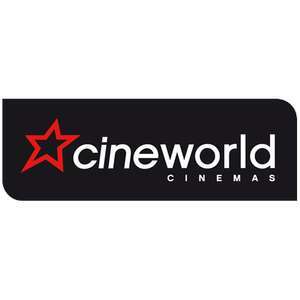 The is particular Cineworld card has its own enquiry line on: 0330 3334444. Cineworld doesn't require customers to register before buying tickets online. Registration for a My Cineworld Account, however, is free and offers the advantage of cheaper tickets. Cineworld says there are other benefits to a My Cineworld Account such as faster future booking and access to exclusive benefits. Furthermore, the Cineworld website allows customers to select specific seats at their chosen screening. Physical tickets booked online can be picked up at one of Cineworld's advance booking ticket collection machines at the chosen cinema. Customers will need to use the credit or debit card used when making the booking to gain access to their tickets. Cineworld has a handy mobile app available for both iOS and Android. The Cineworld app allows registered users to find their nearest cinemas, browse trailers and securely book tickets. Users can also personalise settings by, for example, marking certain cinemas as favourites. There is also a Cineworld Magazine available app which delivers a free magazine to tablets and smartphones of registered users each month. Cineworld says the magazine has the highest circulation of any comparable film title. Customers who have booked using the company's mobile app will receive an e-mail containing a QR code. The Cineworld staff will scan this code to allow access to the cinema, either from a mobile phone or a print out of the e-mail. Cineworld accepts online payment via MasterCard, Maestro, Visa, and American Express. Customers can use a Cineworld gift or eGift card to pay online for their tickets or use their 'unlimited card'. PayPal, however, is not accepted by Cineworld as payment for any of its products. Log in to their My Cineworld account. Cancel the tickets no longer needed with the click of a button. Cineworld notes that only the customer who has made the booking can cancel the ticket(s). Cancellations can be made up to two hours before the screening time and are only available for tickets bought online. 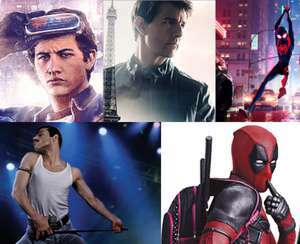 There is also a regularly updated Cineworld blog previewing upcoming releases. An information line is open from Monday to Sunday from 10:00 to 22:00, the number is 0871 2002000. This number can also be used to book cinema tickets by phone, with an extra booking fee applied as opposed to prices charged online. Customers should note that calls to this line cost 12p per minute, plus the standard network connection charge. Customers can also choose to call Cineworld's general information number on 0333 0033444, with lines open Monday to Sunday from 10:00 to 22:00. There is a dedicated helpline for users of Cineworld's "Unlimited card". The number is 0330 3334444, and lines are open Monday to Sunday from 10:00 to 22:00. Customers who wish to e-mail Cineworld can do so at customer.services@cineworld.co.uk. When you're looking for the best deals at Cineworld, the dedicated page on HotUKDeals will keep you up to date with the latest and best bargains from this cinema group.